Lightning's Girl: This Weekend : Cherry Bomb ! Good news! I will DJing this event! Even better, since there are just 5 of us this time, we all get slightly longer sets. 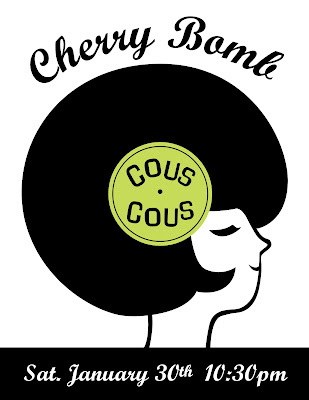 We are loading the gear in this afternoon.... so snow or no snow - CHERRY BOMB AT COUS COUS IS HAPPENING! Even if we ladies have to all walk to get there. I was oddly inspired after putting together the Spoon set for WRIR so my Cherry Bomb set will reflect a lot of rock classics I normally wouldn't play. The good news is we all know the words (admit it, you know the words to Billy Joel's "Big Shot") to these songs and they are total cut loose on the dance floor favorites.